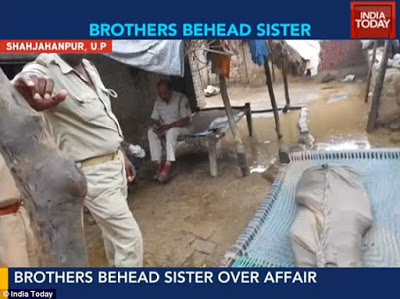 2 Indian brothers decapitated their teenage sister and paraded her severed head through their village because they disapproved of her ‘romantic relationship’ with one of their cousins. Several people watched in horror as Phool Jehan, 17, was dragged out of her house, severely beaten and beheaded by her 2 brothers this past Monday. They however, did not tell the police what had happened. The crime was only later reported by a local security guard, one officer explained. According to Indian Times, Police have been unable to find the two brothers, named Nanhe and Gul Hasan, whose ages are not known. After killing their sister, they left her body on the street as they roamed around the north-Indian village with her head. Honour killings are common across India, but such brutal slayings are extremely rare. While the brothers are on the run, police have detained Jehan’s cousin to question him, said another police officer.